Boost Immunity and Beat the Flu with these Powerful Medicines Found in Your Kitchen, Window-Shelf Pot, or Year Round Growing Dome® Garden. You can use these 5 garden herbs for flu season to boost immunity and alleviate aching, nagging, cold and flu symptoms. I honestly don’t want to talk about the flu. It hit hard this year. It drags on, gets passed around, kind of clears up…. Comes back again, drags on, gets passed around. To make matters worse, when you or your children are in the thick of it, short-term memory loss seems to kick in. It’s easy to forget what to do for yourself and your loved ones. We forget about convenient medicines found in everyday herbs. 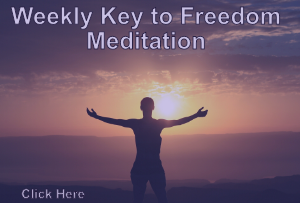 However, this reminder might be the thing to get you back on track for effective and easy self-care. These 5 garden herbs might become your new best friends if you want to supercharge your immune system and beat the aches and pains of this flu season. Drink sage tea this flu season… and the next one… and in between. Here comes some Sage advice… Drink sage tea. Called the “Thinker’s Tea,” Sage has been shown to enhance memory… That’s why it’s first on the list. Drink sage tea… and remember there are power medicines in your garden. Also, Sage tea is effective for relieving your sore throat, and alleviates painful cramping in the gut. It’s pungent, bitter, and astringent. 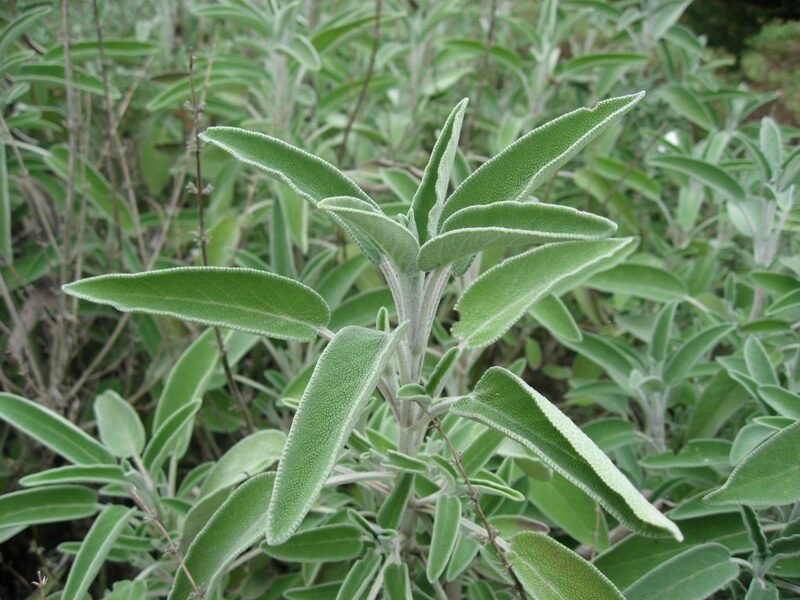 Sage is also anti-bacterial, and a natural antiseptic that is high in vitamin K, vitamin C, and vitamin A. Drink sage tea… Your sore throat will thank you as it tightens and tones the irritated and swollen tissue. Make Sage Tea: Pour 1 cup of hot water over 1 teaspoon of dried sage or 2 teaspoons of fresh leaves. Steep for 10 minutes and strain. 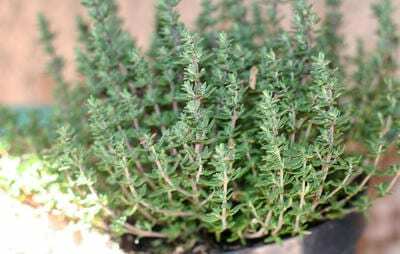 Thyme for help with digestion, immune support, and pain relief. Here’s another tea to ease your sore throat, especially when it comes with a thick white coating on the tongue, congested mucus in the lungs, and spasmodic coughing. Also, Thyme tea promotes pain relief from headaches, cramps, and body aches that are common territory of the flu. Moreover, it’s anti-bacterial, anti-inflammatory, and aides respiratory ailments… Oh, and it’s a mood enhancer that fights depression. Yes, please, I’ll have some. Make Thyme Tea: Pour 1 cup of hot water over 1 teaspoon of dried Thyme or 2 teaspoons of fresh leaves. Steep for 10 minutes and strain. Not just a “nice” tea, peppermint is packed with strong medicine. Peppermint is an herbal tea favorite… and for good reason. It tastes good. It’s refreshing, cooling, and soothing. Thankfully, it also helps an upset stomach, colds, flu, fever, headaches, and sinus congestion. 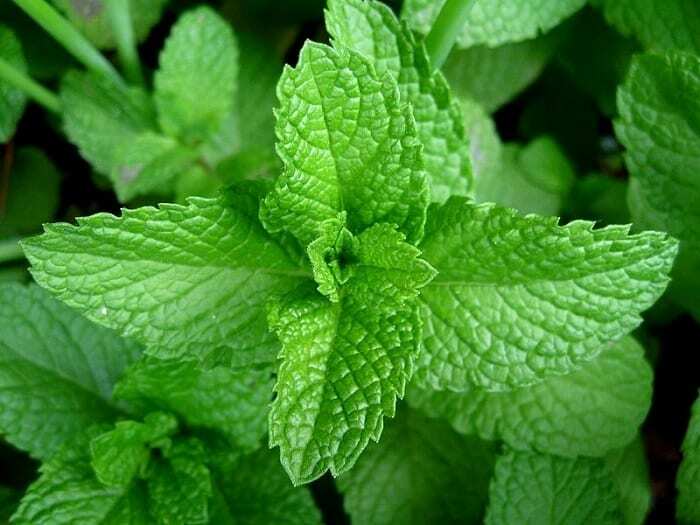 Peppermint opens pores in the body and gives an escape route for excess heat when you have a fever. Make Peppermint Tea: Pour 1 cup of hot water over 1 teaspoon of dried Peppermint or 2 teaspoons of fresh leaves. Steep for 10 minutes and strain. Also, Peppermint is an excellent choice for an herbal steam to break up congestion. Make Peppermint Steam: Pour just-boiled water over a handful of leaves in a medium sized bowl. Put a towel over your head and place your face just above the bowl. Catch and breathe in the rising steam. Make the temperature as warm as you can without burning yourself. 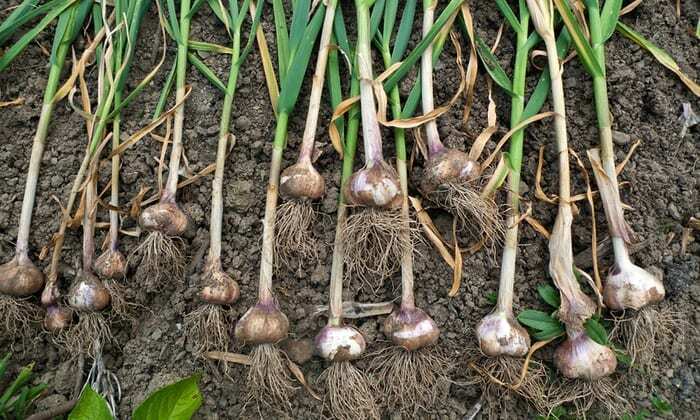 Not really a Garden Herb for Flu… More like a Root for Flu… Or Bulb for Flu… Is it a Stem for Flu? Who knew number 4 would be so confusing, but regardless… Garlic for Flu. 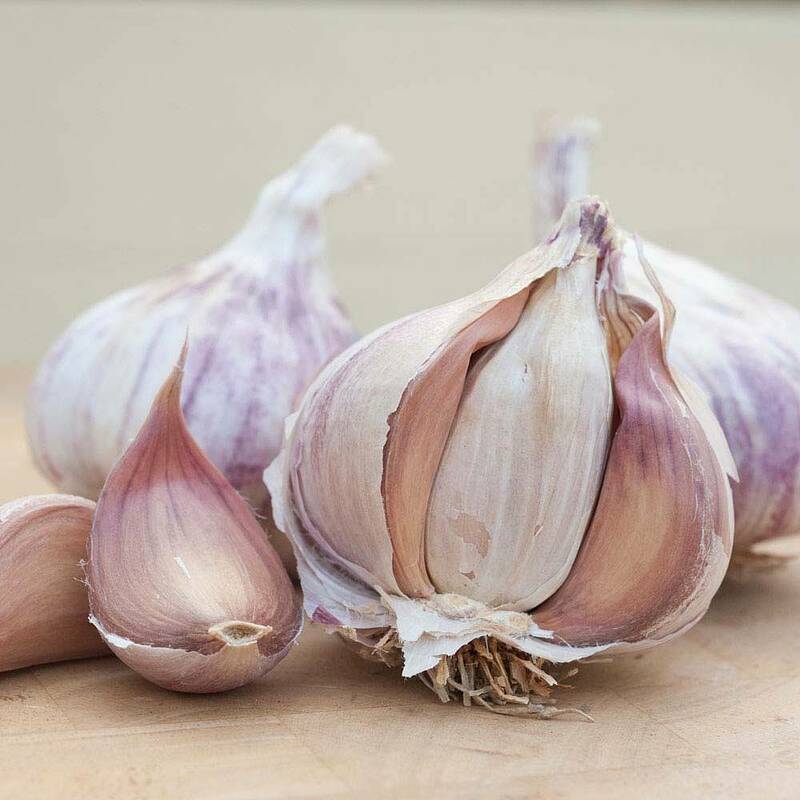 With antiviral, anti-inflammatory, and anti-fungal benefits, garlic has been used for health and healing for thousands of years. Eat garlic. Eat it cooked. Eat it fresh and raw. Eat it any way to get it down. You will stink. Your scent will give you away if you are playing hide and seek, and you might want to refrain from whispering sweet nothings to the one you want to woo for a while. However, it’s medicinal qualities are legendary and effective, bar none. The “Stinking Rose,” as it has been called, should be one of your mainstay herbs for flu season. Rosemary tea for cold and shivery fever. Another of the common herbs for flu, Rosemary, can help with a fever during the beginning stages when you’re cold and shivering. 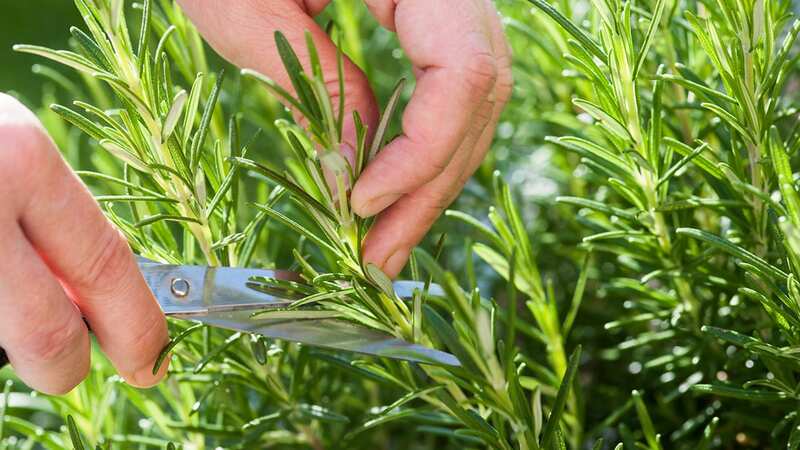 Make Rosemary Tea: Pour 1 cup of hot water over 1 teaspoon of dried Rosemary or 2 teaspoons of fresh leaves. Steep for 10 minutes and strain. Also, Rosemary is another great herb for a congestion breaking herbal steam. Make Rosemary Steam: Pour just-boiled water over a handful of leaves in a medium sized bowl. Put a towel over your head and place your face just above the bowl. Catch and breathe in the rising steam. Make the temperature as warm as you can without burning yourself. Rosemary smells amazing… and the steam delivers relief to nasal and chest congestion. Bonus of the Garden Herbs for Flu, Not just a throwaway fancy garnish. It’s an important herb to have on hand if you are brave enough to build your immunity with number 4, The Stinking Rose. Parsley can be used medicinally as a diuretic and is overall beneficial to the urinary system. It relieves stagnant digestion, bloating, constipation, and gas… while also stimulating a healthy appetite. It’s an excellent source of folate and vitamin K1, giving possible benefits to heart health. Parsley is high in antioxidants and helps reduce systemic inflammations in the body. 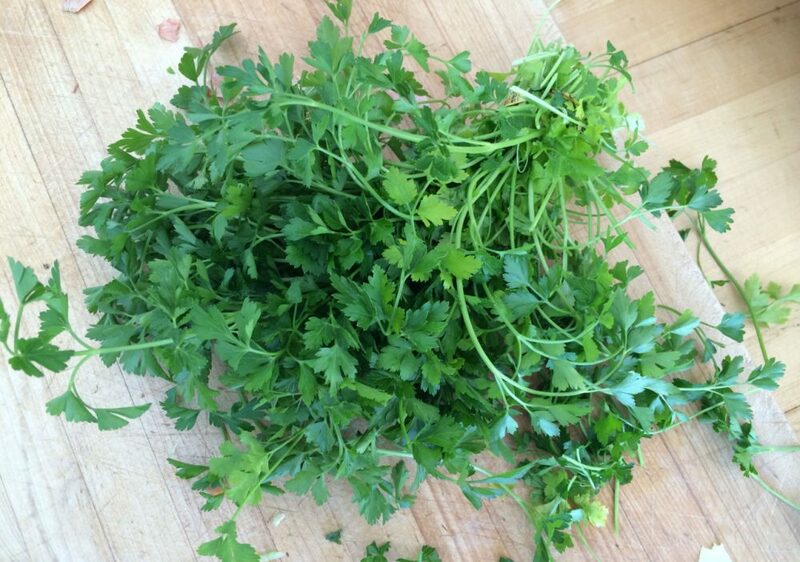 Eat fresh parsley… it’s good for you. But, eat more than the little sprig on the side of your fancy sandwich plate. I mean eat large amounts, a big handful. As you munch cloves of garlic this flu season, chase it down with a handful Parsley. Everyone will thank you… or, at least they won’t completely avoid you. Befriend the Stinking Rose. Eat it Fresh. Eat it Raw. Chase it with Parsley. You can use these 5 garden herbs for the flu season to alleviate the pain and discomforts of being sick. It’s almost inevitable that you, or someone you love, will come down with the flu. It’s out there… chasing you down right now. You don’t know from which direction, person, or sneeze it is coming… but you know it’s there. Wash your hands, wipe down the buggy handles at the grocery store, be wary of the shared phones at work… maybe all of those are worthwhile, and good advice. However, it’s also important to cultivate your own healthy immune system. But we do hold the power to cultivate the natural defense shield of our own immune systems. We just have to do it. And the aides are waiting… in the soil, on the windowsill planter, or sometimes already in your kitchen. So, right now, go make tea. Not over-sweet chai, or London Fog full of caffeine and sugar… make a powerful immune boosting tea… and drink it to wash down the crunchy clove of garlic you ate. Thank you. Excellent info – in a nutshell. Will grow these herbs in pots at home. Looking forward to more info like this. Namaste!